Lehane Environmental provides a range of on-site and off-site waste treatment solutions. Our 70m³ is ideal for projects that require filtration of liquids in large volumes whilst being able to visually monitor the separation phase. 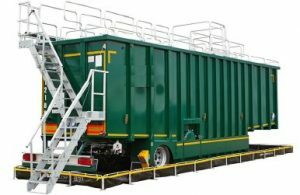 The unit can be mobilised on its own or as part of a larger mobilisation involving 25-70m³ Storage Tanks for both the influent and effluent. We can also provide additional on-site treatment services such as pH adjustment and dewatering using flocculants.